The American Ancestor Robert Drake is the ancestor through whom my claim of eligibility is based. SSN Death Index; Interview: Robert C. Sweeny, Ruth Q. Sweeny, Paul E. Sweeny; Interview: Grandaughter (Linda Laber) of Mary “Nora” Drummond. 5. John F. Drummond born at: Accomack County, Va. on: 24 Dec 1864 died at: Chester, Delaware, Pa. on: 13 Nov 1936 married on: 10 Apr 1888 to: Mary Jane Tapman born at: _____ on: c1868 died at: _____ on: c1910 married at: Worcester County, Md. 1900, 1910 Federal Census; Miles Files 9.0, IBID; Interview: Grandaughter (Linda Laber) of Mary “Nora” Drummond; Peninsula Enterprise, Obituary; Comp Ruth T. Dryden, Lower Eastern Shore Maryland Marriages (including the counties of Somerset, Worcester, Wicomico) 1865-1906. 6. Constantine Drummond, Sr. born at: Accomack County, Va. on: Jan 1838 died at: Sanford, Accomack, Va. on: 9 Dec 1922 married on: 12 Jul 1857 to: Susan Chesser born at: Accomack County, Va. on: c1842 died at: Sanford, Accomack, Va. on: 9 Dec 1922 married at: Accomack County, Va.
1850 Federal Census HH#810; Miles Files 9.0, IBID; Family Tree Maker's Family Archives, Census Microfilm Records: Virginia, 1850, p39/f810. III Barry W. Miles & Moody K. Miles, Wills and Administrations of Accomack County, Virginia, 1800-1860, p. 176 (will of Charles Drummond, wife Comfort); Stratton Nottingham, Wills and Administrations of Accomack County, Virginia, 1663-1800, p. 351 (will of John Drummond, wife Sarah). Mary Lee McCready's Bible; Stratton Nottingham op.sit., p. 194 (will of Spencer Drummond, wife Ann). 10. Richard Drummond, II born at: Accomack County, Va. on: 1692 died at: Accomack County, Va. on: bf.4 Apr 1732 married on: c.1712 to: Anne Hack born at: Accomack County, Va. on: c.1692 died at: Worcester County, Md. on: bf.27 nov 1770 married at: Accomack County, Va.
Stratton Nottingham op.sit., p. 36 (will of Lt. Col. George Nicholas Hack); Accomack Co, VA, Wills & c., 1767-72, p. 507.; Stratton Nottingham op.sit., p. 49 (will of John Drummond, son Hill Drummond) & p. 62 (will of Capt. Richard Drummond of Hunting Creek). Compiler Mark C. Lewis, Mark C. Lewis Genealogy Research Files. ; Accomack Co, VA, Wills, Deeds & c., 1715-29, part I, p. 253; John Frederick Dorman, Adverturers of Purse & Person, Virginia, 1607-1624/25, p. 446 (Utie-Bennett Family); Nora Miller Turman, John Drummond 1635-1713.; Stratton Nottingham op.sit., p. 62 (will of Capt. Richard Drummond of Hunting Creek). 12. Patience Hill born at: Westmoreland County, Va. on: c.1649 died at: Accomack County, Va. on: 15 Nov 1713 married on: 1666 to: Capt. John Drummond, Sr. born at: Accomack County, Va. on: c.1637 died at: Accomack County, Va. on: 10 Oct 1713 married at: Accomack County, Va.
Accomack Co, VA, Orders, 1671-73(iv), p. 132.; Accomack Co, VA, Wills, 1673-76(v), p. 104.; Accomack Co, VA, Wills & Deeds, 1676-90(vi), p. 533.; Accomack Co, VA, Wills & c., 1692-1715(xi), part 2, p. 171.; Virginia Accomack County, Deeds & Wills (& Orders), 1663-1666(i), p. 5b. ; Complier Nell Marion Nugent, Cavaliers and Pioneers, Abstracts of Virginia Land Patents and Grants, 1623-1666, Vol I, p. 276 & 307.; Ralph T. Whitelaw, Virginia's Eastern Shore (A History of Northampton and Accomack Counties), p. 986-987 (tract A87A, inscriptions on a square shaft, preceded by the Drake family's coat of arms). ; J. Orton Buck and Timothy Field Beard, Pedigrees of some of the Emperor Charlemagne's; Descendants, Volume III, p. 123; Count D'Angerville, Living Descendants of Blood Royal, Volume Five. Lucy Ames Edwards, Ames, Mears and Allied Lines of Accomack County Virginia. Compiler Henrietta Dawson (Ayres) Sheppard, Ayres - Dawson and Allied Families, Volume 1, Recording the ancestry of Richard Johnson Ayres Jr. of Accomack County, Virginia and of his wife Elizabeth Hack Dawson of Loudoun County, Virginia, p. 95 (Hill Family). ; Complier Nell Marion Nugent, Cavaliers and Pioneers, Abstracts of Virginia Land Patents and Grants, 1623-1666, Vol I, p. 482 (Patent Book No. 5). ; Stratton Nottingham op.sit., p. 23 (will of Capt. Richard Hill of Hunting Creek). C.G., F.A.S.G. John Frederick Dorman, Adventurers of Purse and Person, Virginia, 1607-1624/5, p. 312 (Bibby Family). ; Complier Nell Marion op.sit., p. 46.; Count D'Angerville, IBID; J. Orton Buck op.sit., p.123. York Co, VA, Marr Reg No. 1.; Pedigrees of Some of the Emperor Charlemagne's Descendants, Volume I, originally published by the Order of the Crown of Charlemagne, 1941, Chapter LXXII; Count D'Angerville, IBID; J. Orton Buck, IBID. J. Orton Buck op.sit., p. 122; Count D'Angerville op.sit. ; York Co, VA, Marr Reg No. 1. J. Orton Buck op.sit., p. 191. J. Orton Buck op.sit., pp. 190, 191. J. Orton Buck op.sit., p. 190. 28. John I, King of England born at: Beaumont Palace, Oxford on: 24 Dec 1167 died at: Newark Castle, Notts on: 19 Oct 1216, bur. Worcester Cathedral married on: (2) 24 Aug 1200 to: Isabella of Angouleme born at: _____ on: 1188 died at: bur. Fontevrault, Anjou on: died 31 May 1246 married at: Bordeaux She married 2ndly, 10 May 1220, Hugh X, Comte de la Marche (d. 1249) and had further issue. Faris, David Plantagenet Ancestry..2nd ed. Boston, NEHGS, 1999. pp279‐280; Stuart, Roderick W. Royalty For Commoners. 4th ed. Baltimore, GPC, 2002. pp. 3, 48; Magna Charta Sureties. 5th ed. Baltimore, GPC, 1999. Faris, op.cit., pp.277‐278; Stuart, op.cit, pp. 3, 49 ; MCS, IBID. Faris, op.cit., p. 277; Stuart, op. cit., pp. 2, 50 ; MCS, IBID. Stuart, op.cit., pp. 50, 89 ; MCS, IBID. Stuart, op. cit., pp.50, 76. 33. 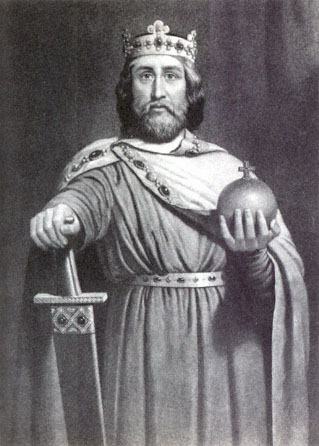 Robert I, Duke of Normandy born at: _____ on: c. 1000 died at: Nicea, Bithynia, Turkey on: 22 July 1035married on: _____ to: Harlette, dau. of Fulbert the Tanner of Falaise born at: _____ on: c. 1003 died at: _____ on: _____ married at: _____She married c. 1028/30 Herlevin de Conteville, Vicomte de Conteville. Stuart, op.cit, pp. 50, 71, 86; AR, op. cit, line 121‐23. Proof [s] Stuart, op.cit., pp. 50, 92, 98 ; AR, op. cit, line 121‐22. Stuart, op. cit, pp. 92, 182 ; AR, op. cit, line 121‐20. AR, op. cit, line 118‐19 ; Rosch, op. cit., pp. 124, 148. AR, op. cit., line 118‐18; Rosch, op. cit., pp.105, 124. AR, op.xit., line 50‐16; Rosch, op.cit., pp. 76, 86. AR, op.cit., line 50‐15; Rosch, op.cit., pp.67, 74. AR, op.cit., line 50‐14; Rosch , op. cit, pp. 63, 67.